A local Act of 1756 established the Colneis & Carlford Hundred Incorporation, the first of many such rural Suffolk incorporations to be set up in the following twenty-five years. By 1758, the Incorporation, which comprised 28 parishes, had built a "House of Industry" at Nacton. Most of the site was donated by a private benefactor, Admiral Vernon, who also loaned the sum of £1,000 towards the cost of the scheme. The building and furnishings cost over £4,500 but within four years the poor rates had been halved and £2,000 saved. According to a parliamentary report of 1776, the poor were employed in making sacking and twine and spinning wool. Able-bodied paupers were employed in "husbandry work when the farmers will employ them". In 1774, net income from poor labour amounted to £248.13s.10d. The workhouse officers were the governor and clerk (£50 per annum), chaplain (30 guineas), treasurer (8 guineas), surgeon for the house (£40) and for outdoor (£42), schoolmaster (£12), baker (£13), barber (£5.4s), and nurse (£4.4s). A shoemaker was constantly employed at 18d per day, a "taylor" at 1s. and a mantua (loose gown) maker at 8d occasionally, plus their board. The sum of £14 or £15 per annum was given as rewards to the most industrious. 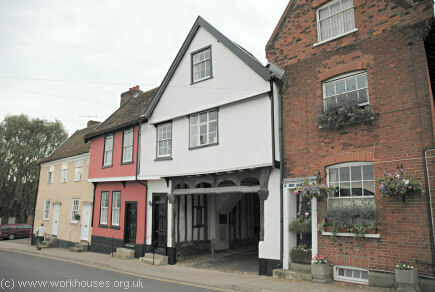 A building on Theatre Street in Woodbridge was used a parish workhouse from 1668. The building had previously house a Free School founded in 1577-85, and prior to that may have been a Guildhall. 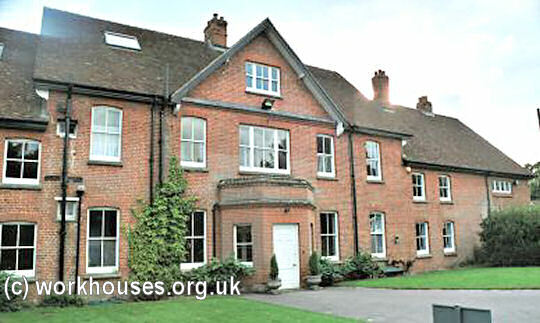 Woodbridge former parish workhouse, 2006. Alderton, Bawdsey, Great Bealings, Little Bealings, Boulge, Boyton, Bredfield, Brightwell, Bromeswell, Bucklesham, Burgh, Capel, St. Andrew, Charsfield, Clopton, Culpho, Dallinghoo, Debach with Boulge, Falkenham, Felixstowe, Foxhall, Grundisburgh, Hasketon, Hemley, Hollesley, Kesgrave, Kirton, Levington, Martlesham, Melton, Nacton, Newbourne, Otley, Petistree, Playford, Ramsholt, Rushmere, Shottisham, Sutton, Trimley, St. Mary, TrimleySt. Martin, Tuddenham, Ufford, Waldringfield, Walton, Witnesham, Woodbridge (4). The population falling within the union at the 1831 census had been 22,163 with parishes ranging in size from Hemley (population 69) to Woodbridge itself (4,969). The average annual poor-rate expenditure for the period 1833-35 had been £18,733 or 16s.7d. per head of the population. In 1836, the new union took over the old Colneis and Carlford Hundred workhouse. By 1900, the workhouse had been closed and is shown on the 1902 map as the "Old Workhouse". After its closure, the inmates were transferred to the Ipswich union workhouse (Kelly, 1900). However, by 1912, Woodbridge was boarding its indoor poor at the Bosmere and Claydon union workhouse at Barham (Kelly, 1912). Amberfield School was subsequently erected on the site. 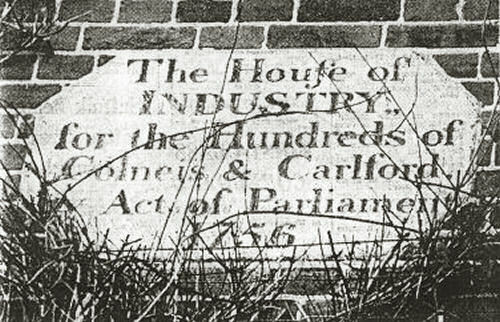 The school building incorporates a date stone from the original House of Industry. The school closed in 2011, with the site expected to be turned over to residential development. Amberfield school from the north-east, 2001. By the 1920s, the Woodbridge Union had established a children's home at Grundisburgh, exact location undetermined. In 1924, it could accommodate 24 children, with Miss Thornham as its Superintendent. Suffolk Record Office, Gatacre Road, Ipswich IP1 2LQ. Limited holdings include: Guardians' minute books (1835-1930); Ledgers (1835-1930)); etc. Kelly's Directory of Suffolk, 1900. Kelly's Directory of Suffolk, 1912.